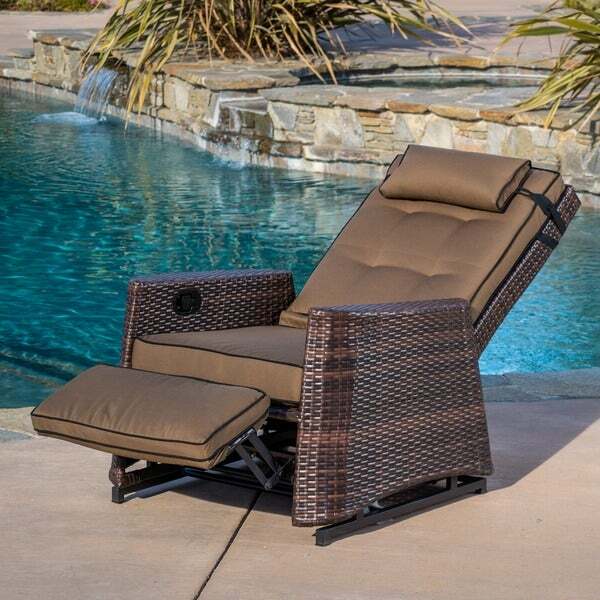 Soak up the warmth of the sun and relax in complete comfort outdoors with this easily adjustable wicker rocking chair. Made from weather-resistant foam and fabric, this sturdy outdoor rocking chair is designed to endure daily wear and tear. This stylish chair comes with seat, back and head rest cushions for added comfort, and it reclines at a 45-degree angle for the utmost relaxation. OMG, An outdoor recliner! A few months ago I was teasing my husband that he needed a "regular" recliner to watch TV on the covered patio. Then I found this one and it is Christopher Knight. I adore Christopher Knight designs! The cushions are thicker than most outdoor chair cushions. The chair is man sized, even for a 6.4 guy. The recliner looks stylish and matches all of the other furniture on my patio. The chair has functioned smoothly. I purchased this outdoor rocking/recliner for my husband for his birthday. He's sometimes not an easy man to buy for, but he loves this chair. It is sturdy and well made with quality materials. It rocks smoothly and is easily reclined and brought back to sitting position. He will enjoy hours of sitting in comfort out on our deck. Chair is O K if you want to lay back. Not good for sitting on patio to watch grass grow. You can't sit up with the foot rest extended. These chairs do not recline all the way back, and the footrest doesn't come all the way up, but the chairs are so comfortable, and I love that it still rocks when reclined. They are perfect on my porch! Great choice for an outdoor lounger especially if you want an easier chair to get in and out of. Dries quickly if it gets some rain on it. Since I'm short, I do need a pillow for the back if I'm not reclined. However, it's not a rocking recliner. It's a reclining glider. The chairs are of good quality and comfortable to sit in. They are heavy so they do not blow around on the balcony of our condo and i leave them out 24x7. My only complaint with the chairs is you can not put just the foot rest up and the foot rest does not raise all the way up. Other than that they glide perfectly even though i drag them around constantly. We recently put in a pool and have 1200 sq feet under cage. Having an outdoor living area, I needed to find a chair my, husband would love. He LOVES this chair. It was 90% assembled. He out the back part of the chair on and it was together. Looks great, super comfortable and great price. I saw similar chairs at patio stores for well over ****. So happy with this purchase! I was really looking forward to a recliner but it is so stiff and hard to recline it takes a huge, strong person to release it. That's not who I am so therefore the recliner mechanism can't be used. I have paid a high price for a wicker rocker. Assembly was very easy. Chairs look great. If you sit upright chair has a glider-like rocking motion which is nice. The recliner function requires both your head and feet "recline," so you cannot sit upright and just have your feet elevated. Boxes arrived on time and in good condition. very well made, but a veyt difficult for a small or elderly person to put into the recline position. Was looking for a recliner for my deck since I was falling asleep in my old canvas chair. Kept debating whether to purchase this because of the cost but I liked the look so much when the price dropped, I went for it. So far absolutely delighted! The hardest part of the assembly was getting it out of the box. So easy, I did it by myself. Perfect match to my other deck furniture. And delivery was super fast. My neighbor absolutely loves this recliner, looks like he and his wife will be ordering from the sound of it! Great chair for the lanai, very comfortable. We really enjoy our reclining rocking chairs. We put them on our covered deck overlooking the lake of the Ozarks and they are always the first seats picked out of the many choices. I think it is the reclining feature that everyone likes so well. I would definitely buy these again and actually am going to this summer for my deck at home as soon as it gets redone. Enjoying these rocking chairs for our door patio! We have little ones, so rocking them comfortably has been great! Chairs are well made and durable. I bought these for an outdoor area so my husband can watch football while reclining in these great chairs! They’re perfect. He loves them. Super easy to put together. One step and done! Very sturdy and solid. Love them! Chair cushions hard but the quality is good. The foot rest does not come up as far as the photo and only comes up at all when the back is completely reclined. This is not a comfortable chair but looks really nice. Great option if you want an outdoor recliner. Super cozy and wide - it gives you the ability to curl up and read a good book. "How do I buy replacement cushions for these rockers?" Unfortunately, we don't sell replacement parts. "Please tell me the measurement of the back rest, the portion my back would be touching, from where the back rest meets the seat to the top of the back rest. The please tell me the measurement of the seat itself, from where the seat meets the back rest to the front of the seat. Then please tell me the measurement of the gap between the seat and the foot rest when the chair is fully reclined. Please then, lastly, tell me the measurement of the foot rest from the top (the part closest to the seat) to the bottom (the part closest to the floor if the chair were closed down). Thank you." The backrest is 26 inches. The seat dimensions are 23.50 inches W X 22 inches D X 19.25 inches H. The gap between the seat and footrest cannot be confirmed as the item is not available to physically measure. The foot rest height is around 18 inches. "Hi. Does this chair rock in the upright position as well as in the reclined position? I just want to make sure it rocks in both positions. Thank you!" I purchased this rocker for my niece, who said that yes, it does rock in either position. Said it's more of a gliding movement. This chair does not "rock" at all. It glides. It does glide whether it's upright or reclined, which is a great feature. "I have 2 and neither foot rest comes all the way up when reclining Is that how they are made or is it defective. In the pictures they don't show any leg rest fully extended"
Yours is not defective. That's exactly how it's supposed to work. "Is there a way to fold the chair down? I saw one on another site and wondered if this folds down too." The chair was for a client, I don't think it folds all the way down or reclines all the way, but it's very comfortable, she likes it, and the fabric was nice. "What is involved in assembling chair - what tools needed? Can one person do it themselves? Thank you." This chair requires no tools for assembly and involves simply sliding the back into the base. Hello natenasty, the chair has a set height of approximately 16.5 inches. Thanks for shopping with us.